Hello, aspirants, there are important announcements for you, if you are searching for CDS Syllabus 2019. The post-update is regarding UPSC CDS Exam Pattern for OTA, IMA, AFA. Candidates can get the current syllabus and paper pattern for the upcoming Combined Defense Services test. This is most important for every participant to clear the examination. Keep reading the information below. If you are also one of those applicants, who just applied for the UPSC CDS Exam, then you need to note the paper Syllabus here. All the necessary topics and subjects are well mentioned here. Kindly, note that this syllabus is as per the updated Notification issued by UPSC. In the later segment of this article also note the Paper Pattern after taking a look at CDS Syllabus 2019. Applicants are hereby advised to carefully check and download the UPSC CDS Exam Pattern PDF for OTA, IMA, AFA. The download link is given in the final segment of this web page. Both the paper pattern and Syllabus are also available in the form of a pdf file. Selection Process in occurrence order: Written Test, Physical Efficiency Test, Personal Interview, and Medical Examination. The examination will be taken for three Subjects namely English, General Knowledge, and Mathematics. Each paper will be of 2 hours and will carry 100 marks per subject. The examination will consist of two Subjects namely English and General Knowledge. The time duration for each Paper will be 2 hours and will carry 100 marks each. Start your preparation from today because the exam is now in your head and no time left. Still, lots of candidates not aware of the right and easy way to prepare for UPSC Combined defence service exam. First of all, you have to look out the step by step guide and tips to crack exam completely. Make a proper time Schedule for you should keep all things according to that schedule. After that check the complete syllabus? Like what topics you have to prepare also verify the exam pattern for better knowledge of how many questions come and in what time you have to complete the test. 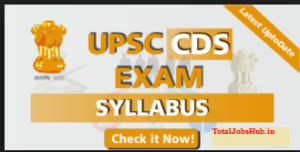 You can also look out the UPSC CDS previous year question papers so that you can get a good idea about the written exam syllabus also buy some best books for the Exam. In the end, start your revision before 15 days of the examination because revision makes you sharp for paper.